Aeschylus’ Prometheus, Sophocles’ Antigone, and Euripides’ Iphigenia are just a few of the characters from ancient lore to appear in the artist’s most recent series, “Sacrifice for the Fleet.” His seventeenth show with L.A. Louver, the consummate exhibition includes eighteen of the 91-year old artist’s most recent large-scale works on paper. 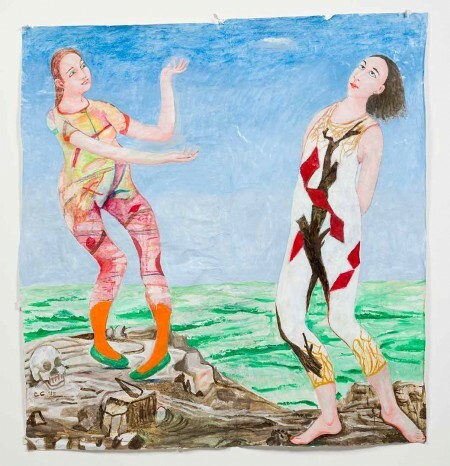 Copyright Charles Garabedian. Courtesy of L.A. Louver, Venice, CA. Garabedian’s title piece, Sacrifice for the Fleet (2014), portrays Agamemnon at his lowest moment of regret, after he’s offered the life of his daughter in exchange for favorable winds to carry his ships to Troy and guarantee Helen’s return to Artemis. Garabedian’s depiction of the king reads anything but regal. Instead, his skin is doughy, his shoulders are slouched, and his knees sag inward. Naked and grasping at the sword he used to decapitate Iphigenia, Agamemnon looks almost oafish after unmasking the tragic grasp of his irreversible failure of judgment. Another work that references Euripides is Clytemnestra & Iphigenia (2015). This beautifully rendered bright and bold painting features both mother and daughter upon their arrival at Aulis. While Clytemnestra stands at the city’s shoreline with her arms outstretched, Iphigenia appears as the innocent pawn. Her arms are bound behind her back while the look on her face signifies surrender. Like a marionette whose supporting strings have slackened, she floats atop the bluff’s edge with her head thrown back and her body seemingly susceptible to the slightest sea breeze. The overall sense of movement inherent in this particular piece is further emphasized by the malleability of the paper on which it was painted. The ocean waves in the background seem to sway as do both figures whose oddly askew limbs create an uncanny yet ever-present fluidity. Another strikingly vibrant painting in this series is Antigone and Polynices (2014). Similar to Nikiforos Lytras’ famed work of the cursed siblings, a forlorn Antigone is portrayed gazing down at Polynices whose betrayal against Thebes cost him the right to be buried. Key in Creon’s eventual fall from grace, this foretelling moment in Sophocles’ tragedy evokes mixed feelings of pity and fear. Although Antigone is fraught with rage, she wears an unexpected expression of affection which shows the depth of her love for her brother. 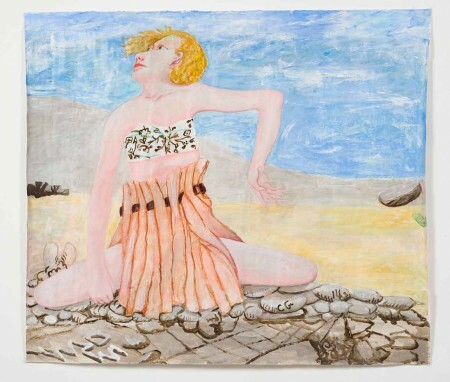 In The Sorrows of Electra (2015), Garabedian again depicts his subject at her most vulnerable moment. After years of mourning her father’s death, Electra experiences a heightened sense of anguish when told, under false pretenses, that her brother Orestes has died. While Garabedian’s portrayal shows Electra collapsed upon the barren earth, she isn’t irresolute. Rather, she exudes a sense of sagacious determination, her expression replete with the recognition that the challenges she must face are symptomatic circumstances pre-destined by the sins of her family. Juxtaposed against his radiant works in color is a select sampling of charcoal drawings that provide a rare insight into Garabedian’s process. He begins most new works by sketching out a gender-neutral form on paper, a medium he finds more liberating than canvas because it allows him to expand upon his concepts as they organically emerge on the page. Curiously, the narratives that inspire Garabedian’s paintings arise from is mark-making and erasures, which are in and of themselves just as spirited as his completed paintings. Instead of choosing his subjects, he allows them to surface on their own. The contortions that a figure acquires over time are what inform Garabedian who the character represents. This is one notable reason why he prefers to work on paper; as the narratives emerge, they often call for more space, which he can provide just by attaching an additional sheet of paper to any one of his works in progress. 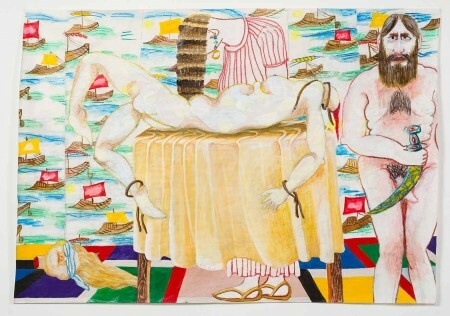 “Sacrifice of the Fleet” clearly iterates Garabedian’s passionate obsession with classical mythology. The work expounds a profound understanding of the subject matter as does it reflect Garabedian’s exceptional aptitude for capturing the state of human frailty. His willingness to engage in an unwitting process of continuing discovery shows that he is more than attuned to his subjects’ mortality but, even more, that he has in fact come to accept his own.